Origin’s Genesis desktop gaming PC, an overclocked triple-SLI liquid-cooled beast of a machine, not only delivers the frame rates, but also gets all the details right. Reasonably priced considering what’s inside. A relative newcomer to the custom PC market, Miami-based Origin PC has a pedigree that belies its newbie status. Founded and staffed by several ex-Alienware execs and techs who jumped ship after Dell’s acquisition, Origin delivers an expertly built and overclocked gaming PC with the Genesis. Origin is a custom builder in the truest sense of the term. 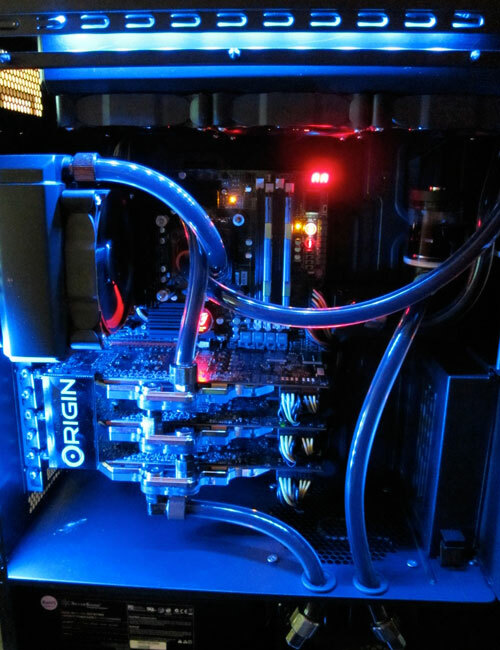 Origin will build you as much PC as you can afford, with whatever parts you wish. They will even build a brand new system in your own chassis, if you so desire. The first thing one notices after removing the side panel is the Genesis’ utterly immaculate interior. Every conceivable wire is tied off and tucked away out of sight, giving the chassis interior an ultra-clean appearance and providing ample space for the cooling conduit that snakes through the insides. It’s really quite something to behold. Since Origin builds the Genesis to order, one at a time, there’s not really a “standard configuration.” Our review system is equipped with an Intel i7 2600K CPU overclocked to a jaw-dropping 5GHz, an Asus Maximus IV Extreme motherboard, 12GB of Kingston HyperX 1600MHz RAM, a 1.5KW Silverstone power supply, three GTX 580 graphics cards in SLI, an EK Waterblock liquid cooling solution, a 12x Bluray burner, two 64GB Crucial C300 SSDs in RAID 0, a 1TB Western Digital 7200prm conventional drive, and Windows 7 Home Premium 64-bit. The Genesis review model came 3D-ready and included two pairs of Nvidia 3D glasses. The case lighting slowly cycles through red, yellow, green, and blue and can easily be turned off. The Genesis comes with a 1-year limited warranty plus lifetime phone support and as equipped, lists for $5,499, but systems start at $1337. The Genesis ships double-boxed in a fits-like-a-glove wooden crate with the Origin logo stenciled on the side, and the chassis itself arrives wrapped in an Origin-branded protective cloth cover. Each Origin system undergoes a thorough burn-in period and rigorous benchmarking before shipping, and the tech performing each task records the results on your invoice and signs off on each stage. This type of thorough documentation allows Origin’s techs to know who exactly built and tested your machine, should any problems arise in the future. The Genesis (with its Maximus IV motherboard) has enough USB 3.0 ports to choke the proverbial horse. Out of the nine USB ports on board, only one is 2.0 only. You also get two eSATA ports, optical S/PDIF output, Bluetooth, ROG Connect, a PS/2 port, Ethernet, and six-channel analog audio outs—all on the rear of the chassis. 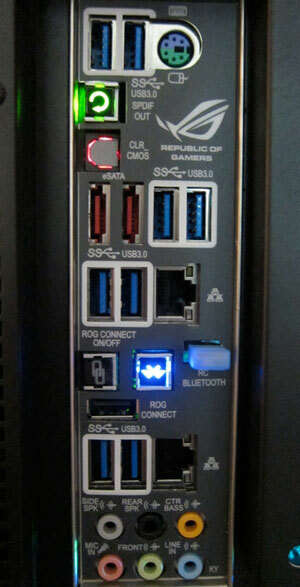 Up front, I/O consists of a Rosewill multi-format card reader, which also has that lone USB 2.0 port. The front of the chassis also sports a four-knob fan control that adjusts the speed of the fans that cool the liquid-cooling system’s radiators. Video editors will appreciate the Genesis’ four, hot-swappable hard drive bays, also on the chassis front, although they will miss having a FireWire connection. That the Genesis killed in gaming performance should come as no surprise. Three GTX 580s will do that. Combine that with a CPU overclocked to 5GHz and the Genesis can handle pretty much anything you can throw at it. Batman: Arkham Asylum, Crysis 2 multiplayer, Far Cry 2, Battlefield: Bad Company 2 — the Genesis had no trouble keeping frame rates above 50 even at 1920×1080 with as much anti-aliasing and complex textures as the titles would allow. In short, for the current generation of games, there’s nothing the Genesis can’t handle. Our review system shipped with a 3D-enabled ViewSonic 1080p projector, and gaming in 3D with a large projected image provided a level of immersion you’d be hard pressed to replicate with a conventional monitor. We even hooked up two more projectors for some ultra-widescreen gaming. After fiddling with settings and the physical configuration of the projectors, we found that three images projected side-by-side against a single surface worked better than our attempt at “surround” gaming, in which we tried projecting three images at three surfaces at right angles to one another. Running all three projectors required taking the settings down a few notches in just about every title to ensure smooth frame rates, but this was to be expected when you consider how much more power three 580s in SLI driving a single projector have than three individual 580s driving three separate projectors. Although we had a good time playing around with the multi-projector configuration, 3D gaming actually felt better when only using one screen, as the sides of the ultra-wide image extended beyond the field of vision offered by the Nvidia glasses. Running 3DMark Vantage in “performance” mode, the Genesis scored P58,497 (a new Digital Trends record): 54,354 for the GPU, and a 75,869 for the CPU. In 3DMark 11, it racked up a score of P14,616, although we haven’t run 3DMark 11 on very many other machines and therefore don’t have much to compare it to. The dual SSD drives in RAID0 plus the ultra-overclocked CPU make general computing a very pleasant experience. Program windows open almost instantaneously, and there’s zero lag from when you click on the Windows Start button and when the menu appears. The OS feels light and responsive, an experience confirmed by a PCMark7 score of 6,166 (which is another high score to-date). Boot time took a scant 43 seconds, thanks no doubt to the super-speedy HDD array. As one would hope from a liquid-cooled system, the Genesis operates very quietly. Though audible, it’s nowhere near noise level we experienced with the also-liquid-cooled iBuyPower Erebus. Along with 3D gaming, the Genesis does a great job with 3D movies too. We watched a few scenes from the Blu-ray of Cloudy with a Chance of Meatballs and were extremely impressed with the 3D imaging. 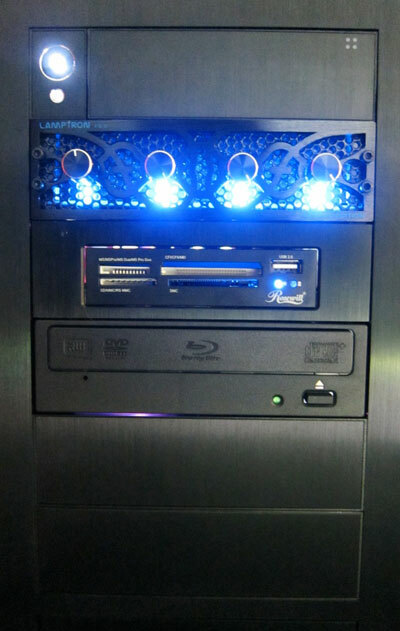 Origin includes a copy of PowerDVD 11, which supports 3D Blu-ray playback, with our Genesis sample. We also had a very pleasant experience with Origin’s tech support. We experienced some graphical corruption when first running 3DMark and some of the game titles, and were just about to the point of pulling cards to diagnose the issue when we spoke to very helpful and knowledgeable Alvaro at Origin. After remoting in to check our software configuration and driver versions, he walked us through the process of testing each card individually by disabling them one at a time with small toggle switches on the motherboard (a great feature of the Maximus IV), only to figure out that the issue was caused by the SLI bridge having come partially loose during shipping. Our pleasant experience with Orign’s tech support bolstered our confidence in the value of the lifetime tech-support Origin includes with the Genesis. Other than that initial snafu, the system was completely stable throughout testing—no crashes, hangs or other anomalies. In a world where just about anybody can stitch together a robust system from the best parts on the market, it’s the details that separate the garage-based DIY enthusiast from the truly boutique integrators. With its sleek packaging, artful integration, and expert overclocking (an art form unto itself), Origin falls squarely in the latter category with its Genesis gaming PC. Pricey though it may be, Origin adds a good deal of value to the equation by offering lifetime (and high-quality) tech support in addition to the one-year hardware warranty as well as the confidence in knowing that your system was built correctly in the first place. Gamers looking for a top-end gaming rig would do well to consider the Origin Genesis, not only for the screaming performance, but also for the peace of mind that comes with knowing it’s backed by a company that “gets it” when it comes to the boutique PC business.